For instructional purposes (either when experimenting on your own, or when demonstrating code to others) it's always useful to be able to run snippets of code in a REPL, or a similar environment allowing fast turnaround in the edit/compile/run cycle. When using Java, other IDEs offer ways to get REPL-like behavior, but what if you don't want to use a traditional Java IDE? Perhaps you just want to demonstrate a trivial bit of code without much overhead. Finally, you'll see your program's output in the console. For further fun, try compiling with javac -g %, then launch your class file with jdb Foo to debug your program from within vim. 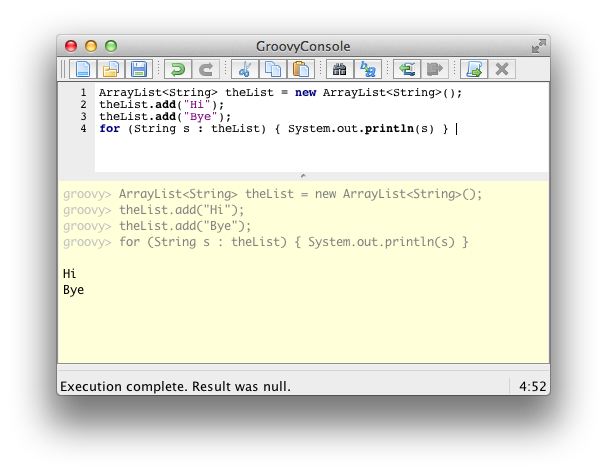 Also, you might consider taking the javacomplete omni-completion plugin for a spin.